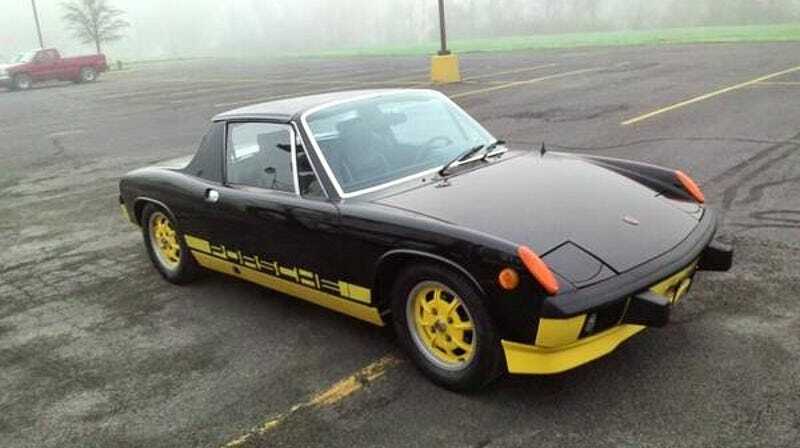 For $29,000, Will This 1974 Porsche 914 Bumblebee Start A Buzz? Today’s Nice Price or Crack Pipe 914 is the nirvana of the four-cylinder cars: two-litre, five speed, with the gauge pack. It’s also an unrestored, limited edition, with paint that earned it the nickname of Bumblebee. Might that just take away some of the sting of its price? Hey, do you remember 2015? I know it was only a few days ago but I have to admit that I’ve already moved on with my life. I mean, 2015 was just so last year. 2016 is where it’s at now. Of course we do still need to take care of some leftover business involving the vote on our New Years Eve candidate: the 2004 BMW R1150RT with Hannigan side car. That bike/bubble was being sold by a bike shop for its 94-year old present owner for, honestly, less than you would probably spend on each separately. Sorry to say however, 57% of you felt that the price was too high, so perhaps he should consider another way to augment his retirement income. BMW Oilheads aren’t yet enough in demand to make their prices climb, but the same can’t be said for Porsche’s 914s. Long the ugly ducky of Porsche’s past, 914s once seemed consigned to sitting on the back-of-the-party couch with Mohammet, Jugdish, Sidney, and the almost-an-Audi 924. That is no more. Today, if you want a cheap Porsche, you’re going to have to go with something fire-damaged, a terrible, money pit front-engined 924, or maybe a 944 that has mushrooms growing on it. The 914s said “so long, suckers,” to those and are now commanding upwards of three-times what they did just about five-years ago. This 1974 914 “Can Am” isn’t just a car on ascension, it’s also one of 1,000 special paint and parts packages that helps make it about the most lust-worthy of the four-cylinder production cars. What makes this car different from your run of the mill 914? Well, first off, it’s optioned to the hilt. This one rocks the 95-horsepower 2.0-litre four, and backing that up, is the desirable five-speed stick. The car also came equipped with fog lights, and the triple-gauge center console, both considered valuable additions today. What makes it really special however is the “Can-Am” paint and packaging that was added on top of the nice specs. The M-778 equipment package added black over Sunflower Yellow paint - as in this car’s case - or optionally, Light Ivory over Phoenix Red, which has been dubbed the Creamsicle. This one is called the “Bumblebee” for obvious reasons, and in addition to the paint it features a unique front spoiler, painted Mahle four-lug wheels, targa bar trim delete, and negative lettered PORSCHE stripes on the sides. The seller says that he has the car’s Certificate of Authenticity (CoA) and that the car is all-original except where it’s not. In this car’s case that means that much of the stuff that has worn out has been replaced with OEM or equivalent parts, and that there are some boogers on the car - things like a chipped windscreen and cracked door latch mount. The paint is described as being good from far, but imperfect up close. It’s also really black and yellow. Mechanically, it’s said to run like a champ and thankfully does still have its EFI in place, with a rebuilt harness to boot. Mileage is 97,000, and while 914 interiors never really seemed to hold up all that well, this one looks totally righteous. It does have an aftermarket head unit, and speakers have been cut into the door cards, but other than that it’s like Nixon’s still in office in there. Or maybe Ford. There’s lots of ancillary replacements and improvements, perhaps most notably some of the weatherstripping and the stainless steel heat exchangers which should promote longevity. The only real oddball element here is the dealer-installed A/C which doesn’t presently work and makes me wonder how hard it would be to make it go away. You might just go away when you see this Porsche’s price. The asking is $29,000. That’s for a four-cylinder 914 mind you. A standard 914 in this shape, even a 1.7, might go for half that. This has all the right boxes checked, and it’s a factory special, albeit one that’s pretty much show with little or no added go. What do you think, does this well preserved Can-Am 914 special edition seem worth that $29,000? Or, is this a bumblebee that won’t fly at that price?